Gulnara Karimova. Image screenshotted and cropped from her music video Round Run. The Internet is swiming with the appalling rumour that Gulnara Karimova, disgraced elder daughter of Uzbekistan's late dictator Islam Karimov, has been poisoned to death by the same brutal government he forged over three decades in power. The single-source report on Gulnara's poisoning that has been quoted by everyone from Russian opposition MPs on Facebook to the British tabloid press, is just that: a single source report. It appeared on Centre1.com, a Central Asian news website run by exiled Uzbek journalist Galima Bukharbayeva, who was famous as the editor of the disbanded Uznews website before it. To be sure Berlin-based Bukharbayeva is no journalistic lightweight. She received the Committee to Protect Journalists’ International Press Freedom Prize for her coverage of the regime-defining Andijan events of 2005 during which anywhere between 187 (official count) and several thousand unarmed citizens were gunned to death by security forces in the Central Asian country. Uznews enjoyed a fairly decent reputation before it suddenly ceased to exist following a hack, suspected as having been carried out by the Uzbek government, compromised the identities of its contributors in 2014. The source for the Centre1 report, however, is a purported anonymous official in Uzbekistan's incredibly opaque SNB security sevice, which is the heir to the Soviet-era KGB and a hive of vested interests at the apex of a political world predicated on violence and intrigue. Currently, therefore, the information is non-official, and impossible to verify. This did not prevent the British Daily Mail newspaper running with the sensational headline Billionaire ‘princess’ daughter of former Uzbek president ‘who was locked up in a psychiatric hospital for two years by his successor has now been fatally POISONED’ , and speculating with no evidence that Karimova was once “the richest woman in the former Soviet Union”. That headline itself harks back to an earlier Daily Mail headline predicated on a Facebook post by an anonymously-run group Health to [Islam] Karimov, that suggested Karimov's successor, interim leader Shavkat Mirziyoyev, had transferred Karimova from house arrest to a psychiatric institute. The late Islam Karimov. Russian government image. Creative Commons. 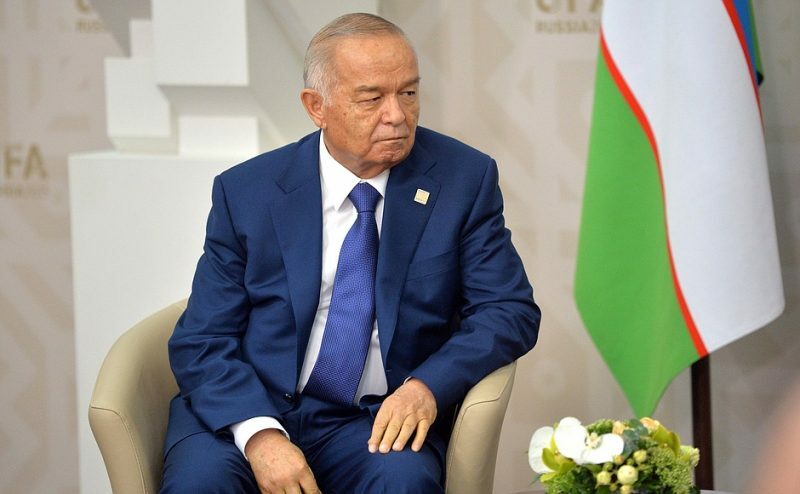 Mirziyoyev of course, could not have kept her there for two years as suggested by the second headline, because he has only been in power for two months, following Karimov's September 3 funeral after a reported stroke. What is known is that Gulnara Karimova — unlike her mother Tatiana and younger sister, Lola, whom she blasted with bitter barbs on Twitter in 2013 — was not shown on television footage from the funeral. It has also been widely reported that she was under house arrest during her father's lifetime from at least 2014 onwards, and that many of her closest friends and associates have been arrested and jailed in recent years. Since she left Twitter after venting at her family, numerous accounts have emerged pretending to her identity, at least one of which was proven to be false by journalists of RFE/RL's Uzbek service. Back up. What is Uzbekistan? Map of Uzbekistan. Creative Commons. A country of 32 million people in Central Asia. 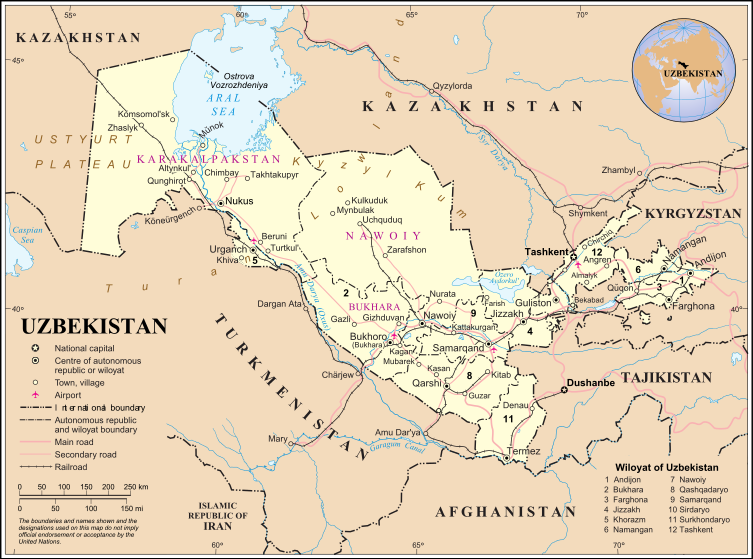 It borders Kazakhstan to the north, Tajikistan to the southeast, Kyrgyzstan to the northeast, Afghanistan to the south and Turkmenistan to the southwest. The Uzbek government is regarded as an elite human rights offender, claiming a place alongside the likes of North Korea, Saudi Arabia and Sudan. Press freedom is close to non-existent, triggering a reliance on foreign based news services with sources inside the country for information about it. The economy runs on cotton, which children and state employees have been documented as being forced to harvest, gold and other commodities. Around three million Uzbeks work abroad in Russia. Karimova performing a duet with Gerard Depardieu. YouTube capture screenshotted and cropped from Newsy World report on Karimova, uploaded onto the outlet's official YouTube channel September 16, 2014. Karimova is 44-years old. Over the course of a colourful and controversy-laden life she has been a pop singer, fashion designer, ambassador to the United Nations and was regularly mentioned as a pretender to her father's throne prior to her well-publicized but little-understood downfall. She is regularly referred to as one of the most corrupt people in Uzbekistan, and is at the centre of ongoing investigations targeting Western-based telecoms companies that allegedly paid her billions of dollars-worth of bribes to secure access to the country's market. While she is known to have very poor relations with her mother and sister, she was once viewed as the favourite daughter of Karimov, which raises the question of how much influence he had over her plight. It was Karimov that supposedly coined for her the nickname Googoosha, that she used as a stage name in her domestic pop career. What does Centre1.com's source say has happened to her? Screenshot of Centre1.com's website 22.11.16. The apparently male source that spoke to Centre1 says that she was poisoned on November 5. During the night of the same day she was buried at a cemetery in the capital Tashkent. The grave was later levelled, he said. The source says he personally participated in burying Karimova. He disclosed the details of the burial to Centre1 because he fears for the fate of Karimova's children, daughter Iman and son Islam [editor's note: named after his grandfather], who he says both live in Tashkent and are “powerless and helpless”. The source provided no other details, according to the report. What have other media reported? Fergana News, a regional news website that was first to report Islam Karimov's death aged 78 (officially announced a week later) and is considered to have excellent sources in the country has reported nothing. Ozodlik, the Uzbek-language branch of RFE/RL with stringers and other sources inside the country has reported nothing. One Russian agency, Ria Novosti has quoted a “source close to the Karimova family” as saying that “Gulnara Karimova is alive and reports of her death are a lie.” Interfax, another Russian agency released a similar report. But reports from Russian agencies are difficult to trust both because of the steep decline in journalistic standards in Russia in recent years, and the importance of Moscow's bilateral relationship with Uzbekistan. These agencies do, however, generally have better sources in the republic than the Western agencies. Who else has said something? Дочь Ислама Каримова, Гульнару, отравили и тайно похоронили в Ташкенте. Это настолько похоже на правду, что трудно не верить. Вероятная преемница своего отца, народные симпатии, душная атмосфера интриг, секретная смерть самого Каримова. Чем более режим закрыт, чем более он авторитарен, тем большая опасность грозит всем, кто к нему близок. Устранить конкурентов, свидетелей, сторонников, воцариться и окуклиться. Насколько далеко мы от этого? Министров и губернаторов уже арестовывают, в тюрьмах уже пытают — все это есть. Еще две ступеньки вниз — до тайных убийств преемников, до расстрелов из минометов, как у лучшего друга и соседа на востоке. 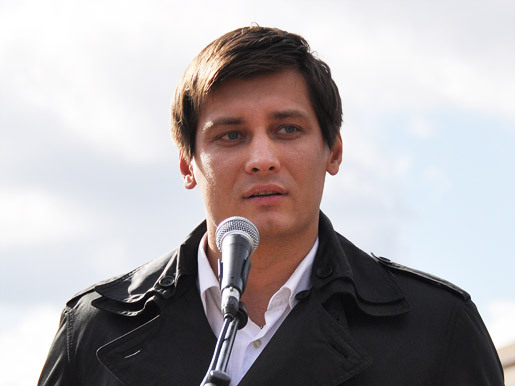 Dmitri Gudkov, MP in the Russian state Duma. The daughter of Islam Karimov, Gulnara, has been poisoned and secretly buried in Tashkent. It is so similar to the truth, it is hard not to believe. The hotly-tipped successor to her father's rule, the popular icon, the thick atmosphere of intrigue, the secret death of Karimov himself. The more a regime is closed, the more it is authoritarian, the greater the danger facing all those who enter into proximity with it. 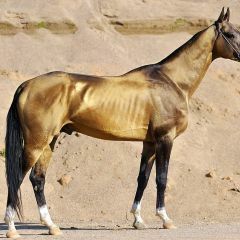 Eliminate competitors, witnesses, supporters, prevail and metamorphose. How far are we from that? Ministers and governors are already being arrested, in prison people are already beaten – it's all there. Two steps further down is the secret murders of heirs to the throne, all the way up to the massacres with mortar fire, like in our best friend and neighbour in the east. С утра многие друзья и журналисты просят меня комментировать появившуюся сегодня информацию о смерти Гульнары Каримовой. Чтобы не повториться, решил публиковать свой краткий анализ здесь. 1. Члены семьи Гульнары Каримовой, а также, новые власти и вся политическая элита Узбекистана считают ее абсолютно капризной, неподконтрольной, импульсивной, и анализируя ситуацию, можно убедиться, что в коридорах власти есть консенсус, что целесообразно удержать ее под «домашним арестом» – не дать ей возможности влиять на политические процессы, поскольку, чего она может сказать или какую информацию она может обнародовать, никто не знает. 2. Судьбу Гульнары Каримовой решает семейный консилиум: мать Татьяна Каримова и ее сестра. Власти до сих пор относятся к членам семьи Ислама Каримова с осторожностью и уважением. 3. Новым властям как-то навредить Гульнаре Каримовой – даром не надо. Впереди – выборы, легитимация новой власти. Для властей был бы кошмаром начинать свой путь с ликвидации члена семьи бывшего президента. Все о чем мечтают новые власти касательно Гульнаре – контролировать ее так, чтобы шума и совокупного вреда были бы минимальным, а контроль – максимальной. 4. Семья Каримовых никогда не дасть согласия на ликвидации кого-то из членов семьи, поскольку, такой шаг был бы катастрофой для безопасности остальных, включая безопасности самой власти. 5. Главная «подушка безопасности» Гульнары – ее сын Ислам Каримов младший, который, с огромным капиталом в руках, сидит в Лондоне. Если с ее матерью случиться что-то реально плохой, он может трубить на все мир первым и коллапсировать репутацию режима на долгие годы. 1. Family members of Gulnara Karimova, as well as the new government and the entire political elite of Uzbekistan consider her capricious, uncontrolled and impulsive, and, analysing the situation, we can see that in the corridors of power, there is a consensus that it is advisable to keep her under “house arrest”. That is, to say, she will not be given any opportunity to influence the political process, because who knows what she might say or what information she could make public? 2. The fate of Gulnara Karimova will be decided by the family council consisting of her mother Tatiana Karimova and her sister Lola. 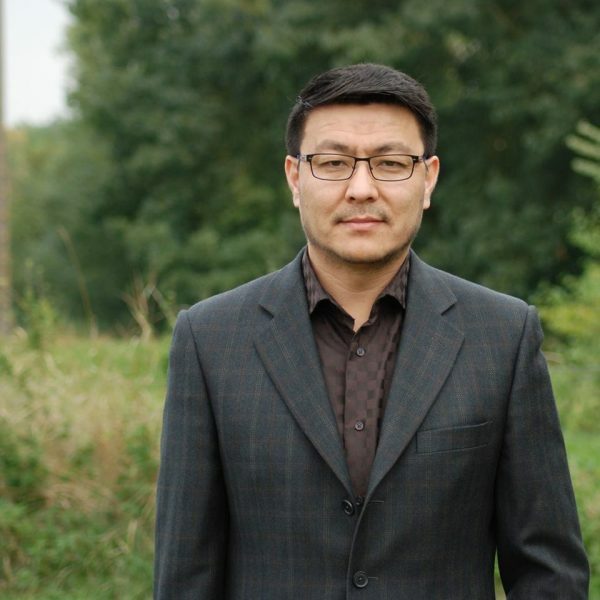 The authorities still treat members of the family of Islam Karimov with caution and respect. 3. The new authorities have nothing to gain from harming Gulnara Karimova. Ahead there is an election [editor's note: a presidential election in which Shavkat Mirziyoyev is extremely unlikely to face meaningful competition will take place December 4] and the legitimization of the new government. For the authorities it would be a nightmare to begin [these processes] with the elimination of a family member of the former president. All that the new government dreams of regarding Gulnara is to control her so that noise and damage is minimized, and control can be maximized. 4. The Karimov family would never consent to the liquidation of one of their own members, because such a move would be a disaster for the security of others, and for the security of the government itself. 5. The main “safety cushion” of Gulnara is her son, Islam Karimov Jr., who, with huge capital in his hand, is sitting in London [editor's note: the SNB source mentioned in the Centre1 report suggested he was in Tashkent]. If something really bad happened to his mother, it could mean a blow that could [further] collapse the reputation of the regime for many years to come. As usual, no-one in Uzbekistan is saying a word.